YouGov | Will the TRAI order change the broadcast game? on March 27, 2019, 11:24 a.m.
With the implementation of the new TRAI regulation in full swing and the deadline approaching soon, YouGov asked consumers about how favorably do they see the new regime and what according to them could be the impact of this change on their TV viewing habits. The research shows that 9 in 10 people (92%) are aware of the new TRAI tariff order and three in four (76%) have already made alterations to their DTH subscription as per the new guidelines. In general, 3 in 5 (62%) of North India residents look at the new TRAI framework favorably. On the other hand, a third of residents from South India (32%) are not so optimistic about the new regulation and more than half (54%) feel they may have to spend more on their subscription going forward. 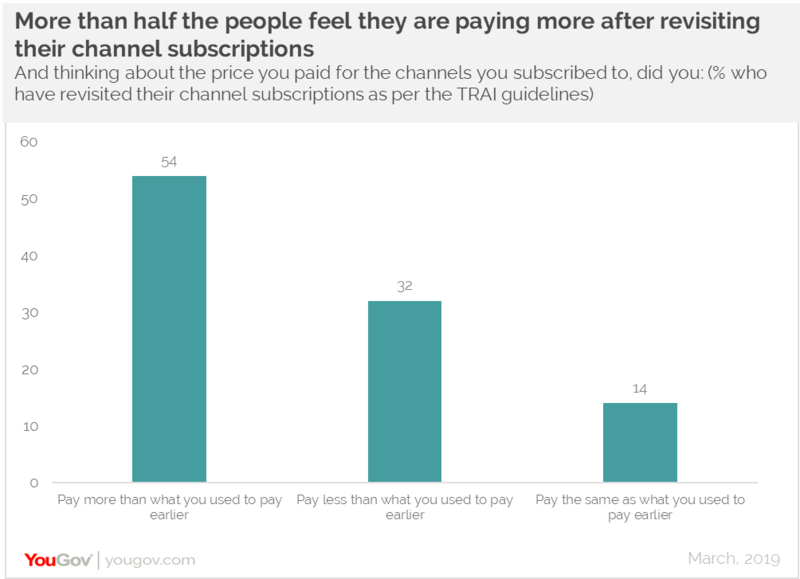 Although the change is meant to offer affordable pricing to the end customer, more than half (54%) of those who have made modifications to their channel subscription said they pay more than what they paid earlier. 3 in 10 (32%) have been able to enjoy the benefits of watching their favorite channels at a fair price and feel they pay lesser than what they paid earlier while 1 in 7 (14%) feel they pay the same amount as before. Despite paying more than what they paid earlier, 3 out of 5 of the switch customers (59%) are of the view that this rule is going to be favorable for end customers like them. The enthusiasm seems to be the same even among those who haven’t yet upgraded their subscription, with 58% of them looking at this change favorably. Where are people watching content now? 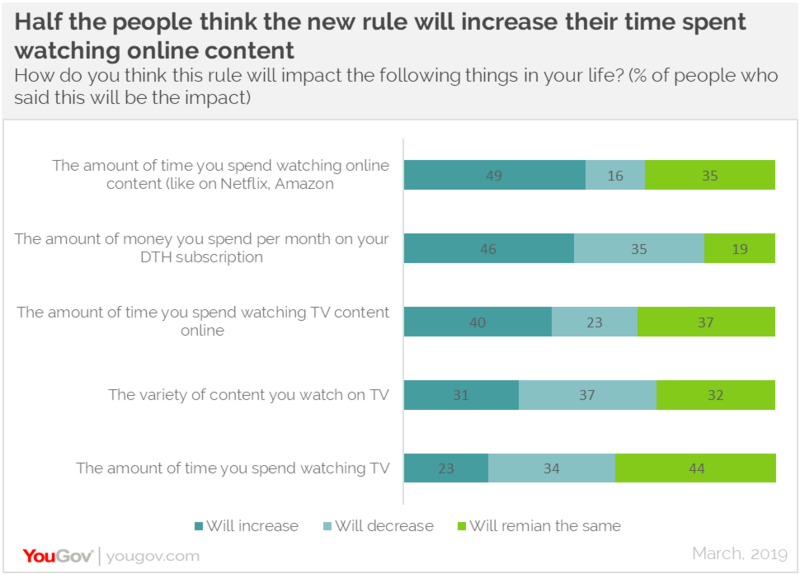 YouGov research shows that half of the people (49%) feel that the new TRAI regulation will increase the amount of time they spend watching original content on OTT platforms (such as Netflix, Amazon Prime, etc.). Not just this, 2 in 5 people feel this move will increase the amount of time they spend online watching TV content. Those who have revisited their DTH subscriptions as per the new TRAI guidelines are more likely to increase their time spent online, either watching TV content or original content, than those who are yet to make the switch. Although the new rule is meant to enhance the customer’s television viewing experience by giving them the freedom to pay for what they view, only 1 in 5 respondents (23%) feel the new framework will increase their TV viewing time while 1 in 3 (31%) feel this move will expand the variety of content consumed on TV. However, 46% of respondents worry this move will increase their monthly spend on their DTH subscriptions. So what are people buying? Of those who have made changes to their DTH subscriptions, half (52%) said they have individually selected all the channels for their household, a quarter (24%) have kept all free channels whilst adding very few new ones and the remaining (24%) have bought a bundle pack which allows them to watch most of the channels at an affordable price. But from those who are going to make the shift in future, 37% said they will individually select the channels, 31% will keep all free channels and add few new ones and 32% will buy a bundle pack. Movies (82%), news (81%), GEC channels (77%), sports (72%) and music (70%) are the channels that people will definitely buy for their household. A higher number of people from tier-1 cities are more likely to buy GEC channels and a lower number of tier-3 city residents are likely to do so (81% in tier-1 vs 66% in tier-2). Star value pack seems to be the popular choice of half the people (46%), followed by Zee Family Pack Hindi (32%). Zee family pack Hindi is more popular in West India but half as likely to be bought by residents of South India (43% in West India vs 21% in South India). Tata Sky stands as the most popular DTH service provider, with 3 in 10 respondents saying they are currently subscribed to it. What is interesting is that around half the respondents (46%) said they are likely to switch to another DTH provider, now that the channel prices will be standardized. 1 in 5 is either unlikely to make this switch (22%) or unsure of their decision (23%). 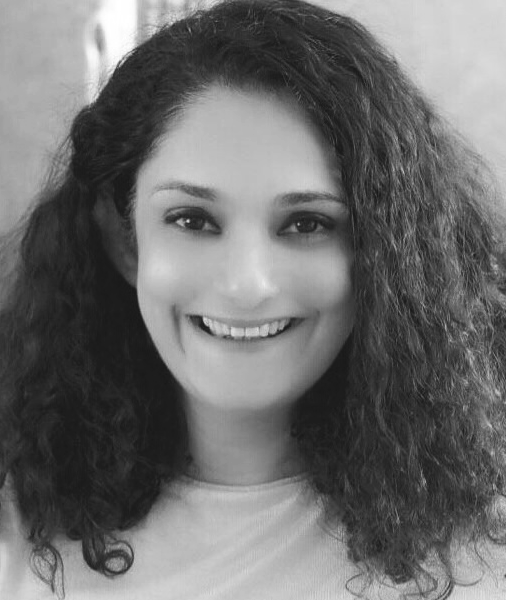 Data collected online by YouGov Omnibus among 1,020 respondents in India in March 2019 using YouGov’s panel of over 6 million people worldwide. Data is representative of the adult online population in the country.